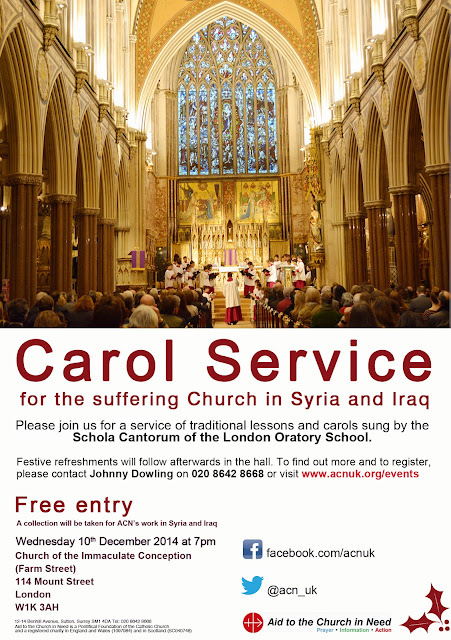 Following Aid to the Church in Need's Advent Carol Service which took place at St Mary Moorfields, London, last week, is a Christmas Carol Service, also organised by ACN. This will take place at the Immaculate Conception, Farm Street on Wednesday 10 December at 7pm and the celebrant will be Fr Dominic Robinson SJ. The service will be held by candlelight and amongst the readers will be Lord Alton of Liverpool. The Schola of the London Oratory School will be accompanied by brass and the organ will be played by Peter Stevens, Assistant Master of Music at Westminster Cathedral. 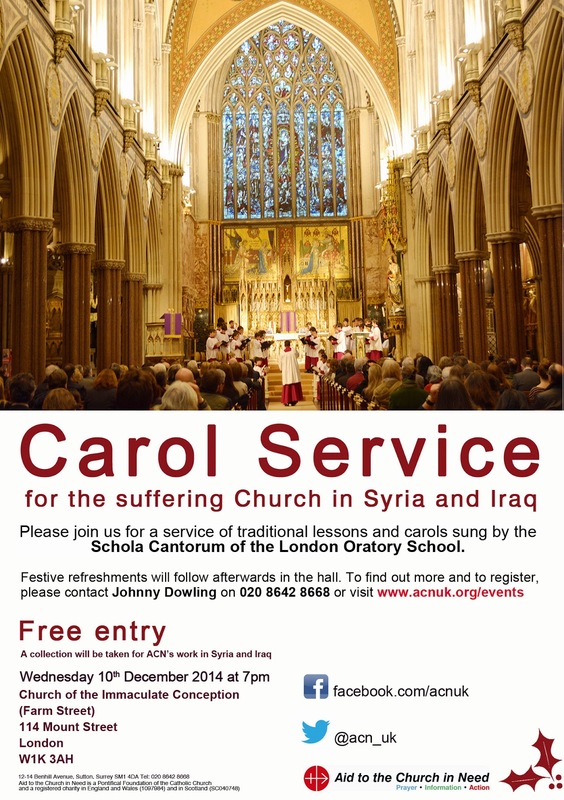 There will be testimonies from the Syrian and Iraqi communities, and the retiring collection will go towards ACN's work in those troubled regions. The Advent Carol Service was very well attended (see photo here) and it is hoped that the church at Farm Street will also be full. The photo in the poster below was taken at ACN's Lenten Service at Farm Street earlier this year. For details of Aid to the Church in Need's events, how to donate and their online shop, please visit the ACN website.